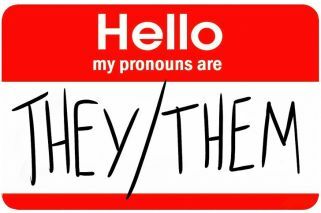 I believe that we are currently in the middle of another important language change which also has to do with identity: gender-neutral pronouns. How do you like people to address you? When you fill in an online form do you choose "Mr.," "Mrs.," "Miss," "Ms.," or even "Dr."? 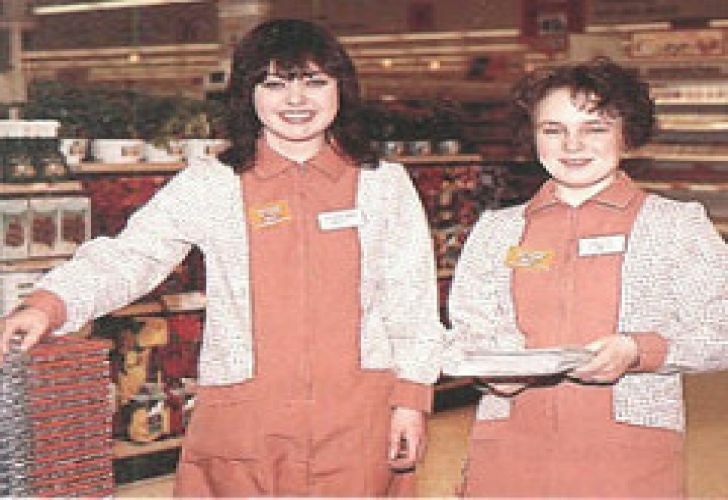 I always choose "Ms." and have done so ever since the early 1980s, when as a student I worked at a Sainsbury’s supermarket. The worst thing about the job was the uniform, which was truly awful. In fact it was so terrible that a friend once borrowed mine to go to a Hallowe’en party. It was like wearing an orange-and-beige plastic bag. Even then I knew exactly what it meant, that it was a title for a woman who didn’t want to be defined by her relationship to men. But I did not know that it had been started by one woman, Ms. Sheila Michaels. 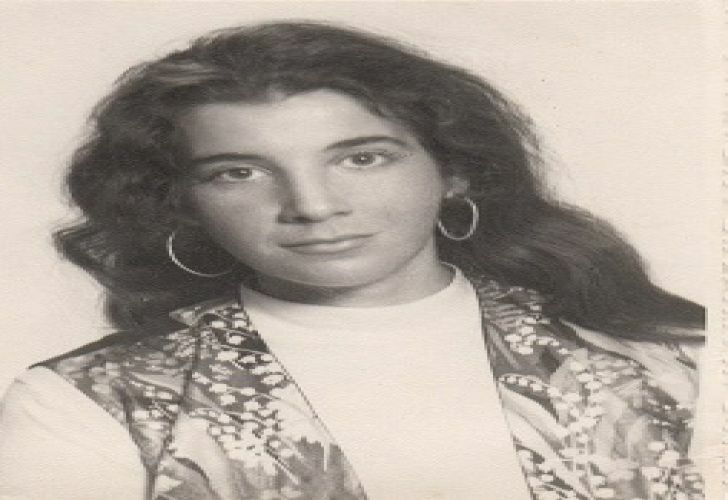 She had campaigned for the use of "Ms." as early as 1961, but it wasn’t until the homonymous feminist magazine used "Ms." as its name in 1976 that it really took off. Today we take "Ms." for granted, but I believe that we are currently in the middle of another important language change which also has to do with identity: gender-neutral pronouns. It has always been difficult to find an elegant way of referring to men and women simultaneously in English. Repeated use of “he or she” or “he/she” is awkward as well as increasingly inadequate. 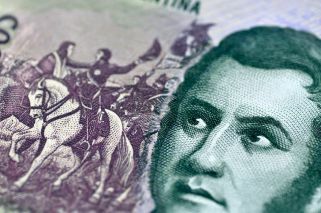 This, to quote Johnson in The Economist newspaper is “singular, epicene they…” which follows “centuries of the finest literary tradition,” as it has been used in the King James’ Bible, in Shakespeare and in books by Jane Austen and Emily Dickinson, to name but a few. Yet in the last decade or so, a different parallel use of singular “they” has emerged: a non-binary “they.” This is “the use of ‘they’ as a personal pronoun by people whose identity is neither male nor female,” to quote Kory Stamper in her article The long, long history – and the bright future – of genderless ‘they,’ published in The Boston Globe on September 5, 2018. This use of gender-neutral “they” had been around for several years, particularly in the LGBTQAI+ community and some academic circles, where it co-existed with other more unusual invented gender-neutral pronouns which have not been as successful. 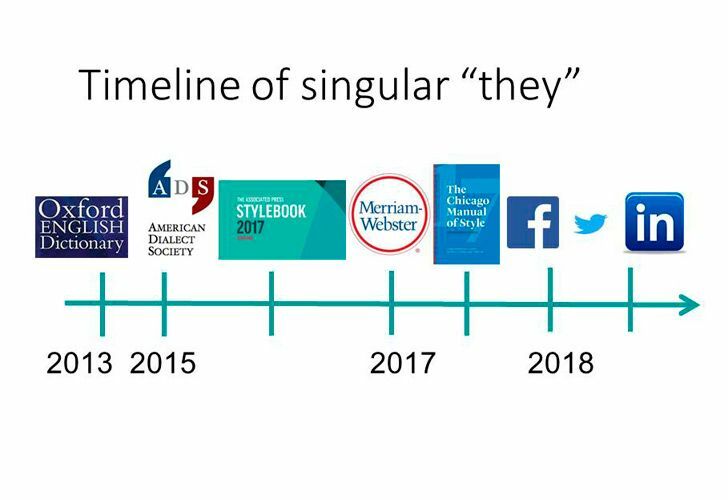 But it wasn’t until singular “they” was chosen by the American Dialect Dictionary as their 2015 Word of the Year that it really took off. After that, the rest is history. As you can see from the timeline above, the majority of the world’s major English-language dictionaries and style guides followed suit in recognising singular non-binary “they,” some more cautiously than others. 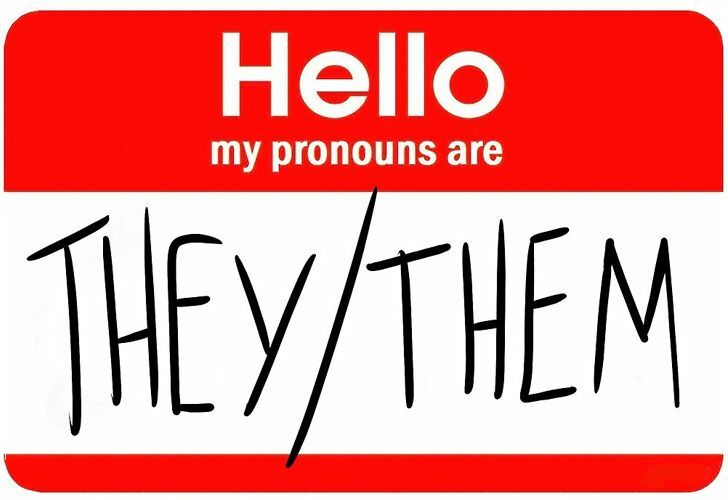 On social media, in some major newspapers, and in many English-speaking academic circles singular “they” is now being widely used in a non-binary way. Academics are stating their own pronoun of preference and numerous people are now beginning to add their preferred pronoun to their business cards and email signatures. At a recent Clarity Conference on plain language in Montreal, I was on a panel about gender-neutral pronouns around the world. Ingrid Olsson of Sweden spoke about the gender-neutral pronoun that the Swedish have invented, 'hen,' which has come into widespread use since 2012 and was consecrated by the Swedish Academy’s official dictionary in 2015. Clément Camion, from French-speaking Canada, addressed the challenges of introducing gender-neutral language into a language as grammatically complex as French – and told us that there was still a long way to go. My contribution was that, while not as advanced as the Swedish who invented a whole new gender-neutral pronoun, in English it does look as though the time when we can choose not only our title, but also our pronoun has arrived. It now appears that singular “they” is here to stay.